Icelandic lamb is super yummy! Some pages on the internet even claim that Iceland has the best lamb in the world. 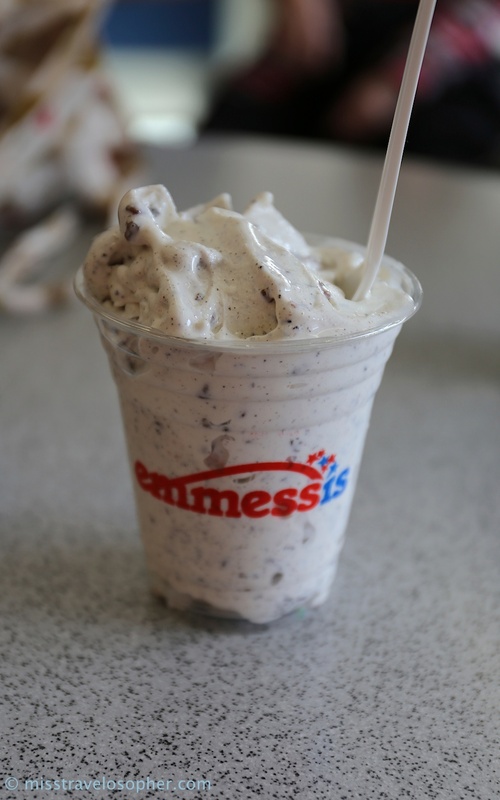 It is THAT delicious. Well, it’s easy to understand why as the Icelanders let their sheep roam freely to graze on grass on highlands in the summer months. If you ever drive around Iceland’s country side during summer, you will definitely notice more sheep than the number of cars on the road. 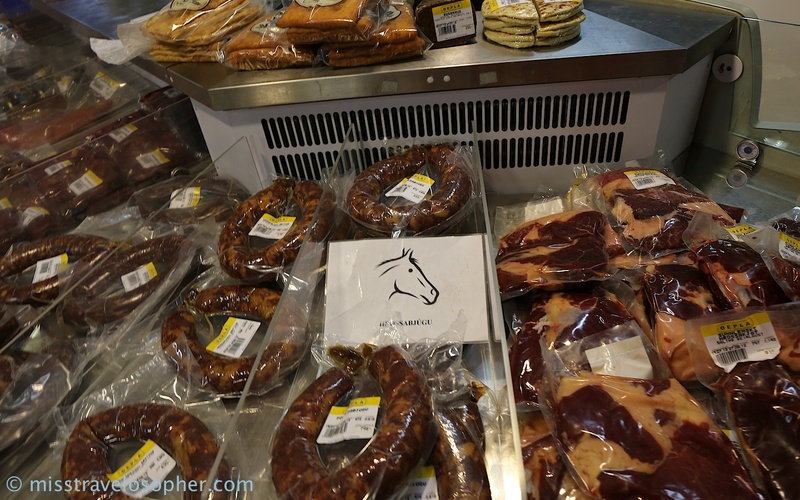 Given the pristine environment – fresh air and clean mountain streams, the lamb meat turns out to be extremely tender with very little hint of the ‘lamb game flavour’ (you know what I mean). We ate so much lamb during our stay in Iceland than I ever had so far. 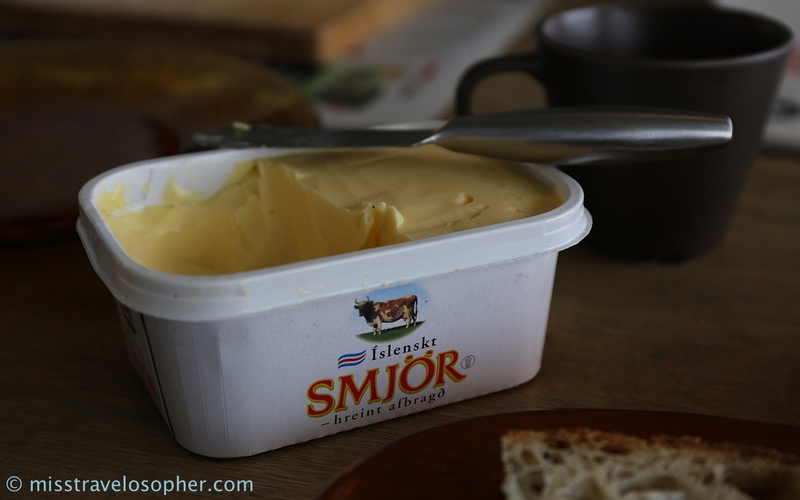 Smjör Icelandic butter tastes so creamy and buttery. The butter has a deep yellow color and it was so good that we smothered our breakfast bread with a thick layer of butter every morning. Seriously, not all butter are created equal! The great taste could probably be accorded to the ban in usage of antibiotics and hormones in Iceland. The cows are also grass-fed and once again, I always believe that this has something to do with the general lack of pollution and clean environment that the Icelandic cows grow up in! 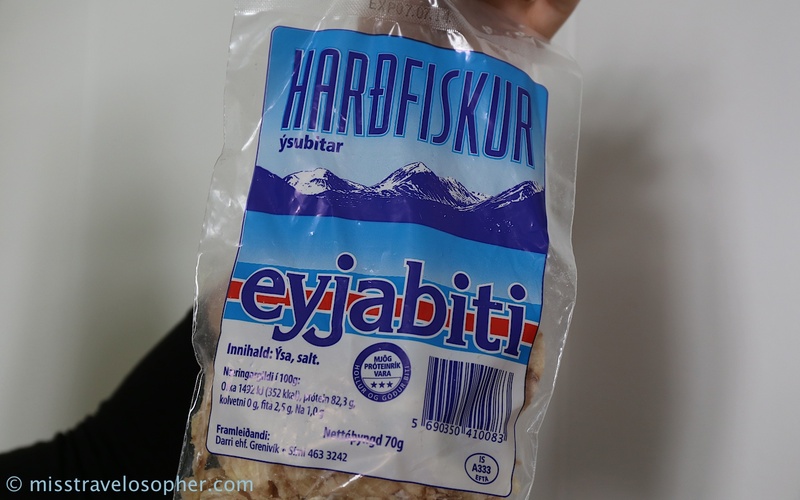 Harðfiskur (pronounced as ‘har-th-fiskur’) is a traditional Icelandic food. It is basically dried fish which is popular as a snack and eaten like potato chips. It is usually eaten dipped in salted butter and allowed to soften in the mouth before chewing. I tried this and found it to be too unique for my palate. It tasted and smelled rather fishy (it is dried fish after all). 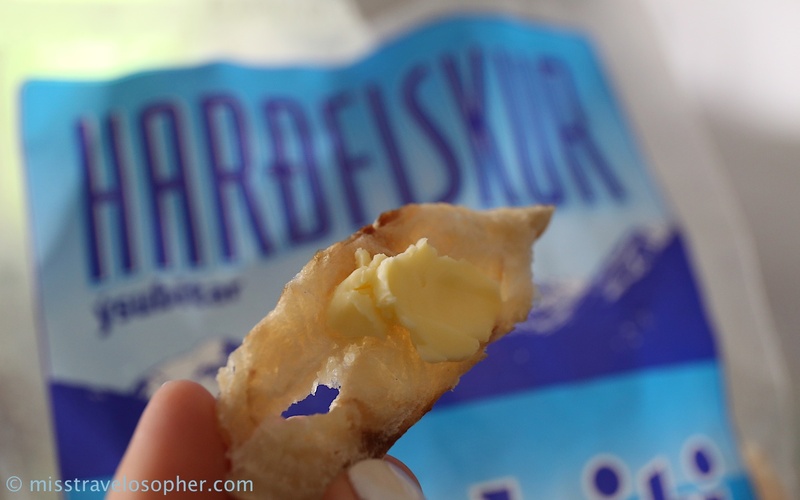 We had to double bag the pack of Hardfiskur to prevent the smell from getting to the rented car! Skyr is delicious! 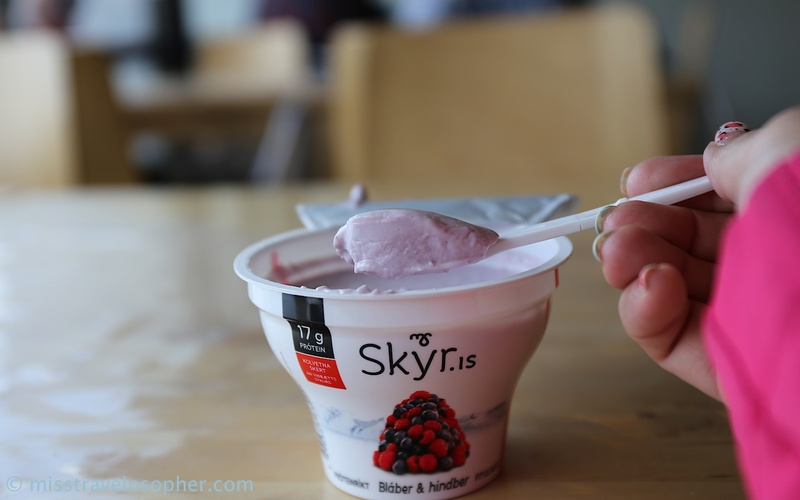 Skyr is a traditional Icelandic food which has a history dating back to thousands of years. It is a cultured dairy product with a bacterial culture similar to yogurt but it is technically a kind of soft cheese and not yogurt. The texture is similar to strained ‘Greek’ yogurt and is actually low fat and made from skimmed milk. Traditionally, skyr is served with sugar and cream. Now with commercialization, you can find many flavours of Skyr (berries, fruits, vanilla, caramel etc) available at supermarkets. It tastes slightly sourish and has a tinge of sweetness. No way!!! How could anyone eat this cute fat lil’ seabird with colourful beak??! 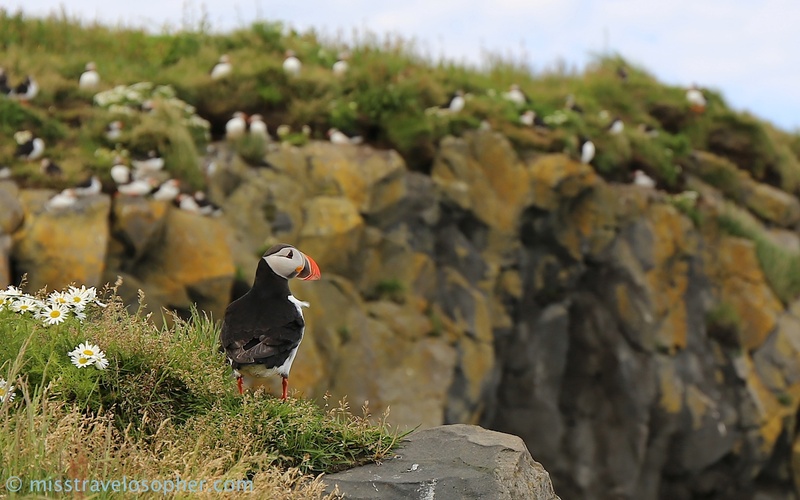 Puffin is rather commonly served in Icelandic restaurants. I did not try this dish T_T For those who may be interested, it is said that puffin is usually smoked or grilled, and it is a red meat tasting somewhat like beef with a gamey and fishy taste. The meat is also said to be more tender than duck. 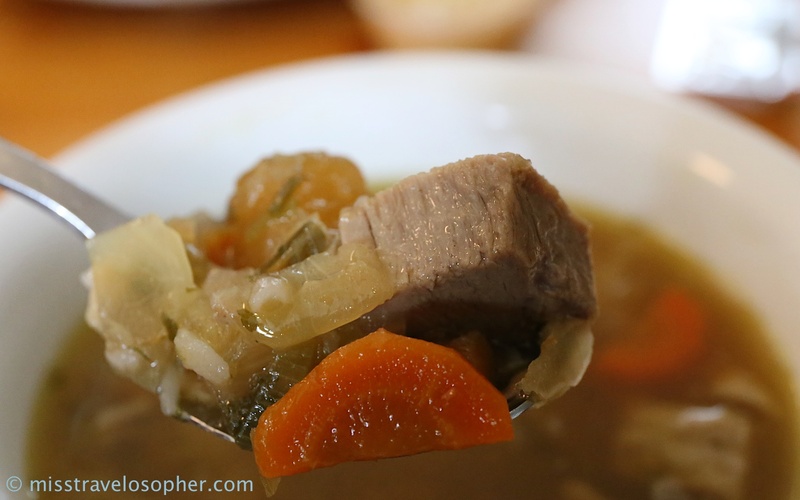 A delicious clear soup of lamb, potatoes, carrots, onions and some other vegetables. It feels good to have this hot bowl of stew on a cold day. 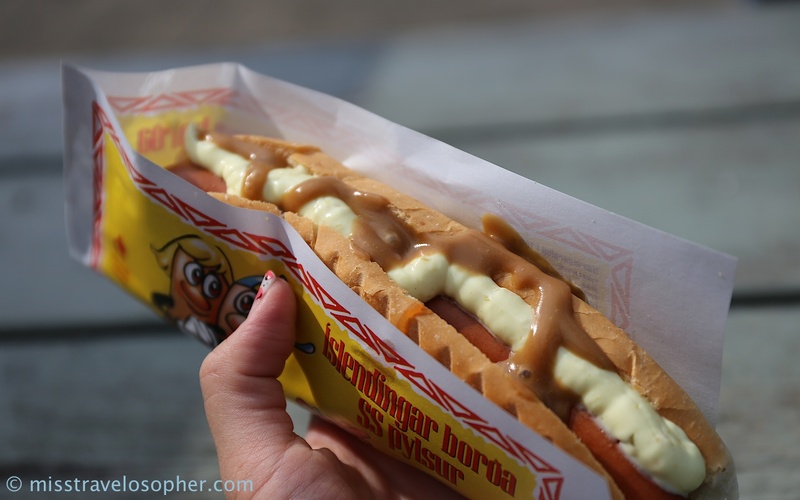 Icelanders love their hot dogs. Hot dogs are ubiquitous and can be easily found everywhere from gas stations, convenience stalls, stands etc. The hot dog is usually made with a combination of lamb, beef and pork, and served with sweet mustard, crispy fried onions (cronions), ketchup and remoulade (a mayonnaise-like sauce). The best hot dog stand in town can be found at Reykjavik’s Bæjarins beztu pylsur. 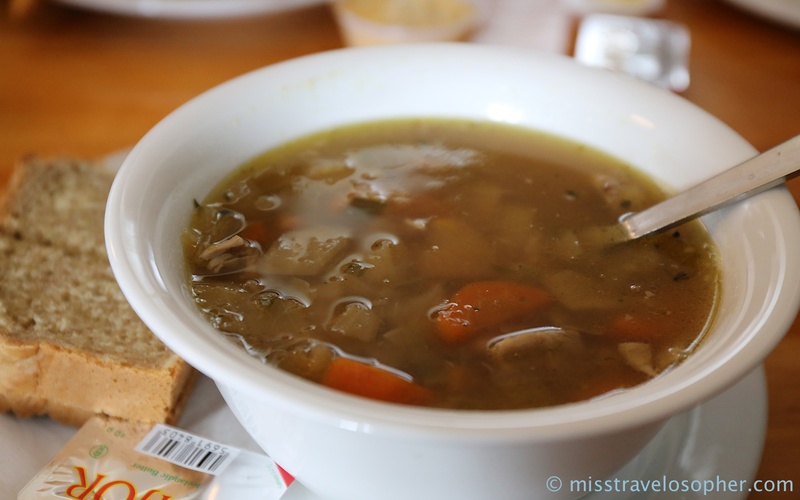 I really enjoyed everything I ate while I was in Iceland… just wished I had stayed longer so I could have tried more! I wanted to try the dried fish – I like strong flavours but maybe it would have defeated me too! I tried foal and it was delicious… but I really couldn’t try puffin… as you say, too cute! Yes, the chefs in Iceland can really cook up delicious meals! 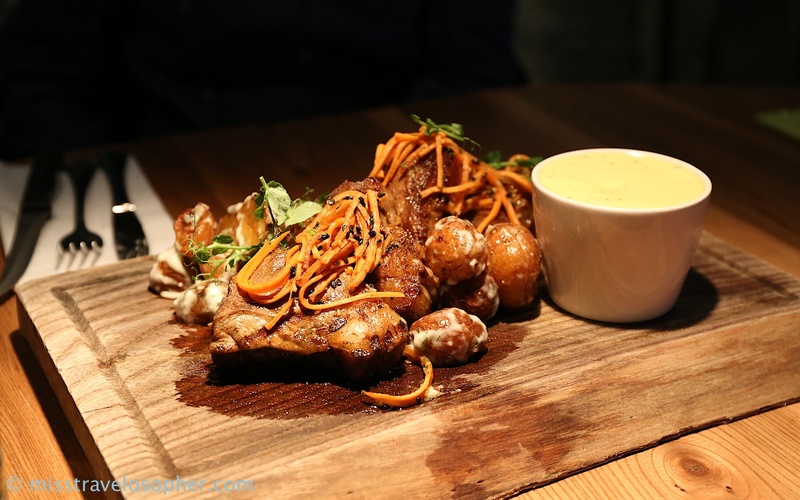 I tried a couple of restaurants at Reykjavik and totally enjoyed the food. Same goes for the restaurants I went to in some small towns. Didn’t try foal, and seems like I sure missed out on something! Across the series, Ainsley is on a culinary adventure exploring the food of the world… But he’s not heading for all the best restaurants, he’s throwing away the guide book and getting off the beaten track…. He’s hitting the back streets! Our team have heard that the food in Iceland is fabulous and unusual so we’re heading over in a few weeks. Ainsley’s keen to explore its rich food culture and unexpected delights, but he wants to do it by going where the locals go, to discover the oldest food traditions and the latest trends. What we really need is for Ainsley to meet up with locals who can take him to the places they go to with their friends or family, so he can experience the rich and unfamiliar food Iceland has to offer. The whole point of this new series to take the viewer on a wonderful culinary adventure, to the kinds of places only the locals know. Can you help? Do you know anybody who (speaks English and) knows the food scene in Iceland, or somebody with their finger on the pulse of everything culinary? Do you know someone keeping a blog, writing about the latest food trends?….. If so it would be great to hear from you! What we’re really hoping for is that you, or somebody you might know can give us a steer on the kinds of places Ainsley should visit and some local people people he can meet – Or even cook with. It would be great if you could help out so we can really capture the magic and flavour of Iceland.